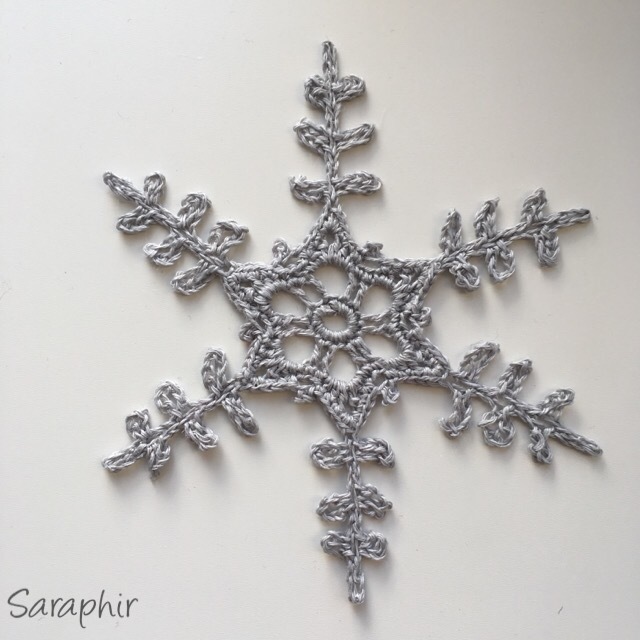 I promised in my last post with the Small Feather Snowflake that I would be posting more snowflake patterns during October, so I thought I’d better get on with it! Here’s the next one: Medium Feather Snowflake. 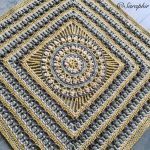 As you can see the pattern is made using the same principle as the Small Feather Snowflake – and you probably won’t be surprised to hear there’s a large one to come as well! 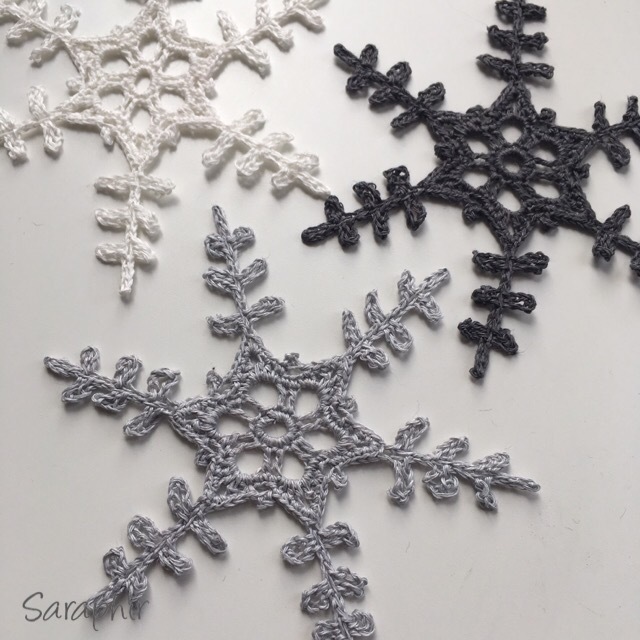 I made the patterns for these snowflakes a couple of years ago and I make them every year to sell at local Christmas markets. 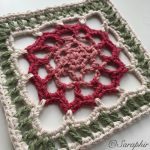 I make my snowflakes in 3-ply linen yarn – it’s fine and fiddly work, but they become very elegant and crisp and they have been going down a storm! 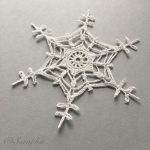 All my snowflakes work well as a mix and match and I sell more of the snowflake strings I make than of single snowflakes. So on with the pattern. 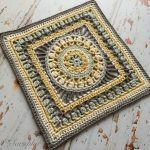 It is given below in both UK and US terms – you can find translation and abbreviation guides on the page Crochet Terms. I use a 2 mm hook for the 3-ply linen yarn, but of course any yarn can be used. 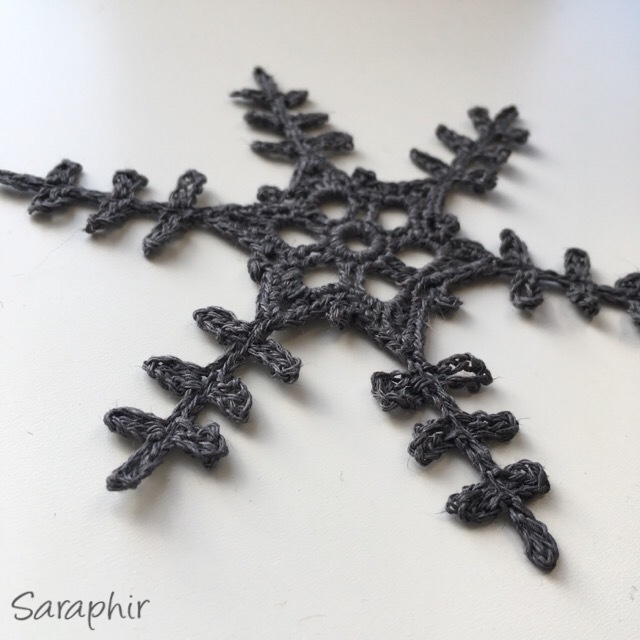 When made with 3-ply yarn the snowflake measures 12 cm from tip to tip. You’ll need to block the snowflakes after they’re made and I stiffen mine after blocking using a mixture of PVA glue and water. Please remember that these are my designs and are my copyright – feel free to use them for yourself, but please do not repost the pattern as yours – Thanks! Foundation ring: ch 6, ss in first ch to form a ring. Round 1: ch 1 (doesn’t count as a stitch), 12 dc in ring, ss in first dc. Round 2: ch 3 (counts as tr), 1 tr in next dc ( ch 4, 1 tr in next 2 dc ) x 5, ch 4, ss in 3rd ch of ch 3. Round 3: ss in next tr, ch 1, * (1 dc, 1 htr, 1 tr, 2 ch, 1 tr, 1 htr, 1 dc) in 4 ch sp,** 1 dc in next 2 tr * repeat from * to * 5 more times, ending at ** the last time, 1 dc in 1 ss (last ss of round 2), 1 ss in first ch. Round 4: ss in 1 dc, ch 1, 1 dc in next 2 sts, * work in 2 ch sp: [2 dc, ch 1, ch 8, ss in 8th ch from hook, ch 2, ch 7, ss in 7th ch from hook, ch 2, (ch 6, ss in 6th ch from hook) x 3, ss in 2 ch, ch 7, ss in 7th ch from hook, ss in 2 ch, ch 8, ss in 8th ch from hook, ss in 1 ch, 2 dc ] 1 dc in next 3 st, ch 4, ss in 4th ch from hook, skip 2 dc, 1 dc in next 3 st * repeat from * to * 5 more times omitting the last 3 dc the last time, ss in first ch. Fasten off and sew in ends. Round 1: ch 1 (doesn’t count as a stitch), 12 sc in ring, ss in first sc. Round 2: ch 3 (counts as dc), 1 dc in next sc ( ch 4, 1 dc in next 2 sc ) x 5, ch 4, ss in 3rd ch of ch 3. Round 3: ss in next dc, ch 1, * (1 sc, 1 hdc, 1 dc, 2 ch, 1 dc, 1 hdc, 1 sc) in 4 ch sp,** 1 sc in next 2 dc * repeat from * to * 5 more times, ending at ** the last time, 1 sc in 1 ss (last ss of round 2), 1 ss in first ch. Round 4: ss in 1 sc, ch 1, 1 sc in next 2 sts, * work in 2 ch sp: [2 sc, ch 1, ch 8, ss in 8th ch from hook, ch 2, ch 7, ss in 7th ch from hook, ch 2, (ch 6, ss in 6th ch from hook) x 3, ss in 2 ch, ch 7, ss in 7th ch from hook, ss in 2 ch, ch 8, ss in 8th ch from hook, ss in 1 ch, 2 sc ] 1 sc in next 3 st, ch 4, ss in 4th ch from hook, skip 2 sc, 1 sc in next 3 st * repeat from * to * 5 more times omitting the last 3 sc the last time, ss in first ch. Fasten off and sew in ends. 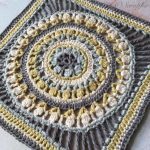 If you would like the snowflake patterns in a PDF file you can get 3 patterns in one file from my Etsy shop or Ravelry store. 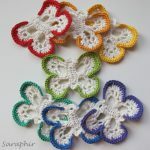 These files include a photo tutorial to one of the snowflakes which will make the pattern easier to follow. 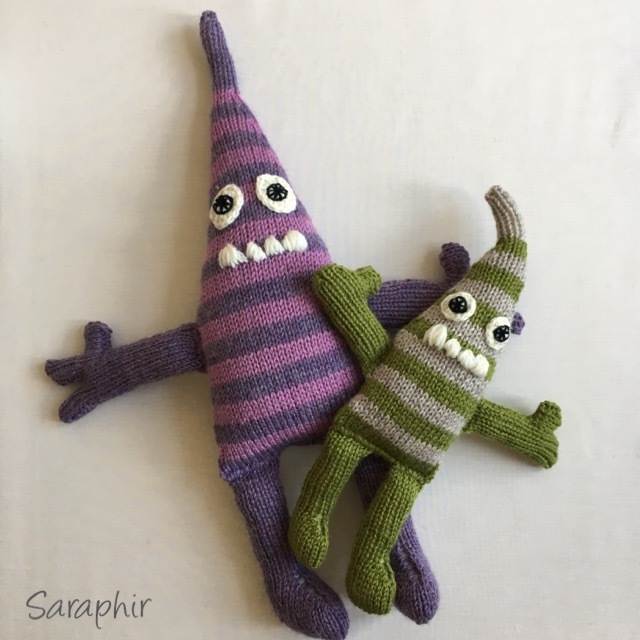 I hope you enjoy the patterns and have fun making! 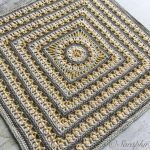 I will be posting more snowflake patterns over the next months as well as some knitted hat patterns and more. To stay posted you can follow my blog (button on the sidebar or below) or follow me on Instagram and Facebook. Hope to see you around and to see your pictures!